Are you looking for a short enjoyable hour podcast? Check out This American Life’s most recent podcast: Expect Delays. The podcast talks about being in travel, in transit, something we are all familiar with. They do a story about a comedic pilot who does some quick stand up before she flies, the multiple day traffic jams in China, and how some drivers deal, and a small town in Ohio that keeps twisting laws … for better or worse. Check it out! As a traveller, I greatly appreciated the humor. Elvis & Nixon tells a (mostly true?) story of the legendary meeting between The Most Powerful Man in the World and The King. The story is the stuff of legend: Elvis Presley, concerned with the direction that his country was headed, decided to meet with the President to discuss what could be done to rectify the situation. Of course, Elvis being Elvis, he simply pulled up to the North Gate of the White House and handed the guards a hand-written letter addressed to Richard Nixon and then went back to his hotel to wait for the invitation. Needless to say, the President had far more important things to worry about than meeting some pop singer, but with some persuasion and outright manipulation the meeting of giants took place on December 21, 1970. The photograph that was taken during this meeting is still the most frequently requested photo from the National Archives. Frankly, I don’t know much about Elvis or Nixon, and perhaps that’s why I was able to enjoy this film. I read reviews by the experts in politics and pop-music critisizing the film for its lack of historical accuracy, its absurd tone and errors in casting. But to me the movie felt entertaining and just absurd enough to be believable. Michael Shannon looks nothing like Elvis, and Kevin Spacey beares a little resemblance to Nixon, but that doesn’t stop them from delivering stellar performances and perhaps even breathing new life into these familiar figures. Shannon does an especially fine job in conveying the two sides of Elvis: the quiet, lonely boy from Memphis who is yearning to be taken seriously and seen for who he really is; and the larger than life King of Rock’n’Roll who revels in his own brilliance and believes himself to be greater than any man, even the leader of the free world. Kevin Spacey has less material and screen time to work with, but he does a great job in portraying Nixon as a three-dimensional character who balances being the President, a father and a simple man from humble beginnings. 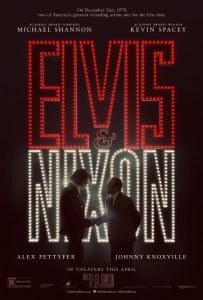 Elvis & Nixon is an interesting blend of fact and fiction that is able to strip away the superficial status symbols and show an intimate portrait of two great men relating to each other on a basic human level. John Wick was a surprise hit of 2015, a slick stylish jam-packed action movie that relied on hand-to-hand combat and actual stunts rather than resorting to over-edited fight sequences and CGI effects of many contemporary action films. The sequel was bound to happen and I would say the results are mixed. John Wick chapter 2 is bigger, louder and bloodier than the original and, for an action film, that’s usually great. However, in this case I was surprisingly bored with the action that repeated the sequences of the first film, making them longer and – dare I say it? – boring. 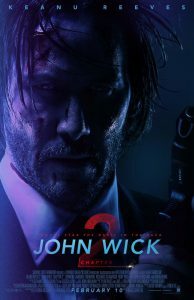 My main problem was with the seeming invincibility of John Wick – yes, we’re told that he’s the best assassin there is, but with all the underworld trying to kill him, with assailants coming at him from every side, his constant recovery seems utterly unrealistic, even by action-movie standards. John Wick 2 felt like a Marvel movie where the stakes are kind of high but also meaningless because you know none of the main characters can die so the action loses its thrill. Keanu Reeves is still impressive in the title role, performing almost all his own stunts while also flexing his acting muscles. There are some welcome cameos and knowing winks to the audience who are able to spot them. And we are given more access to the underworld assassin network, in case you were wondering about those coins and markers from the original film. At the end of this over-long chapter in John Wick’s life the stage is set for the third and hopefully final movie, which I am still planning to see if only to complete the trilogy. 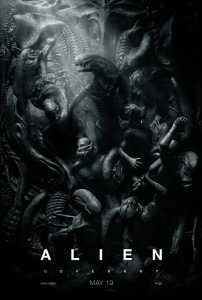 The latest chapter in the Alien franchise picks up the action where Prometheus left off and delivers even more explanation of the origin of Aliens. The question is, do we need to know so much about these monsters, or is less truly more? Alien: Covenant is a peculiar blend of familiar scenes and new concepts. The plot is almost identical to the previous film, Prometheus: the crew of a colony ship in search of a new inhabitable planet veers off course and winds up on a different planet that seems perfect but turns out to be anything but. The crew sets out to explore and repeats the mistakes of their predecessors: venturing out into unknown terrain with no protective gear, putting their hands and faces where they don’t belong, risking multiple lives and entire ships in order to save just one person, not asking important questions, etc. However, without these errors in judgement the plot wouldn’t be able to move forward to the one thing we really need in an Alien movie – the Alien in question. Here we get a thorough explanation of the origin of the Alien species and everyone will take away from it what they can. Personally, I was intrigued but also disappointed: to me the movie monsters work much better when they are shrouded in mystery. The cast is headlined by Michael Fassbender who, as many believe, was the best thing about Prometheus. Here his role is expanded which allows him to deliver an even more nuanced and crucial performance which stands out among the other interchangeable characters. The main attraction is, of course, the Alien creature that you are able to observe in various stages of development. Alien: Covenant is a must for those who are still curious about the Alien mythology, but could feel unnecessary for non-fans. Kimmy Schmidt is a Mole Woman. She was abducted by The Reverend and held captive for 15 years in an underground bunker. Kimmy, along with three other women, believed that the Apocalypse had happened and The Reverend saved only them from a horrible death. The show opens with the Mole Women being rescued from captivity, transported to New York City for an interview with Matt Lauer and quickly shipped back to Durnsville, Indiana. However, our protagonist Kimmy rebels against her victim status and decides to make a life for herself in New York City. 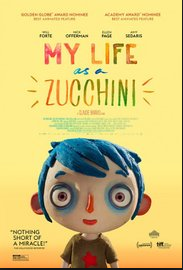 Armed with only a middle-grade education, zero knowledge of the modern world and plenty of zest and perseverance Kimmy embarks on her perilous journey to happiness. I find this show tricky to recommend. You can either love it or hate, which is exactly why I stayed away from it for so long. Kimmy’s unbridled enthusiasm can be either infectious or annoying; the other main characters – a flamboyant gay roommate, an eccentric land lady, a spoiled billionaire’s wife – can be seen either as a fresh new take on the old stereotypes, or as been-there done-that seen-a-lot-of-shows-about-them characters; the handling of such topics as kidnapping, captivity, religious cults, sexual violence, race and immigrants rights can feel either refreshing or offensive. 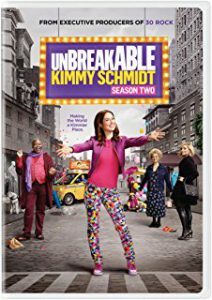 The first two seasons of Unbreakable Kimmy Schmidt are available for check-out in our library, so you can give it a try and see if this is a show for you. 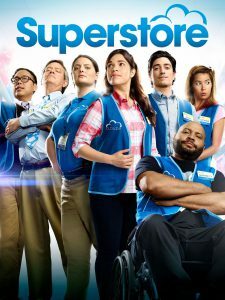 Superstore, now in its third season, is a new addition to our collection, with seasons 1 and 2 available for checkout. It’s a workplace comedy, a 20-minute sitcom to be enjoyed by the whole family (kids of middle-school age and above). Adults will appreciate the jokes and certain situations and character types, while the kids can learn something about teamwork and running a business. The action takes place in a giant supermarket, much like Walmart or Costco. We get to meet the team of somewhat dedicated employees, led by a super-postitive store manager Glenn and a much more cynical and practical assistant manager Amy, played by the former Ugly Betty star America Ferrera. At the beginning of season one a new employee, Jonah, joins the team and we get to experience the store and its inhabitants through his outsider’s perspective. Superstore is a rather enjoyable show, not a masterpiece but an entertaining and whimsical sitcom that can keep you occupied and entertained. The Fast and the Furious franchise has been around for so long that even if you’ve never seen one of these movies, you know what to expect. There will be fast cars, hot girls and a lot of action. Yet the filmmakers know they can’t simply rely on the tried and true formula, but have to keep finding ways to top themselves. 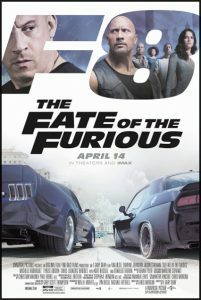 Which makes you wonder: how do you top Furious 7 where a super-car blasts through not one, not two, but three Abu Dhabi skyscrapers; a fleet of cars parachutes out of an airplane; The Rock flexes his way out of a cast and shoots down a helicopter with the sheer power of his newly restored biceps; and a fight between Vin Diesel and Jason Statham destroys an entire car park? The Fate of the Furious has the answer. Have not one, but a hundred cars tear through the streets of New York City; have Vin Diesel drive a car that’s literally on fire; have The Rock fight Jason Statham while breaking out of a super-secret underground prison; and finally hijack a nuclear submarine and have it fire missiles at the super-cars racing on the North Sea ice! The beauty of this movie is its emotional core that keeps the outlandish mayhem from going out of control. The Fast and the Furious films have always put an emphasis on family, especially the family you make for yourself. With the tragic departure of Paul Walker, the franchise had to go in a new direction and further explore the idea of family, flipping it on its head and testing the loyalty of the core group. This attention and devotion to the characters and their relationships is what sets this franchise apart from countless other action movies. Another attractive feature of The Fate of the Furious is its impressive cast. Apart from the original crew, and the recently added Dwayne “The Rock” Johnson, Jason Statham and Kurt Russell, we get introduced to the group’s most diabolical antagonist, portrayed with steely precision by Charlize Theron. All in all, The Fate of the Furious is a superb action film that will keep you entertained, thrilled and emotionally engaged. Check out this podcast if you are looking for a good story. Oliver Sipple was just a guy going for a walk, when he found a big crowd of people waiting for the president. He stood in the crowd, waited with everyone else, and then as a woman took out a gun to shoot the president, his intervention saved him. He was able to deflect the bullet and was heralded as an all American hero. However, this put him in the public eye, in the spotlight, and soon information came to light that was broadcast from coast to coast. To his parents, to his community, to his friends. Life was never the same for him. Listen to the rest to find out more. As a librarian, I must confess that I’m not much of a reader. I can’t sit still, and have a terrible time sitting for long stretches and reading. I am, however, a rabid consumer of audio content, both audiobooks and podcasts. I’ve been wanting to recommend some podcasts recently, and thought I would take this moment to write about the recommendations. First off, if you are just starting with Podcasts, you may want to get a curation tool for your phone or device. I like BeyondPod, which allows easy downloading, and is free. This American Life: Stories of life, usually in 4 acts, centered around a common theme. My favorite, absolutely, is Prom, 4 stories of the beauty of the High School Prom. Radiolab: A variety of topics, from one of their first episodes about Blood, the social context and biology under the skin, to Eye in the Sky, about a drone that tracks crime, to an episode about how we experience our Things. Radiolab Presents More Perfect: One of the Radiolab authors spun off into a podcast all about the history and context and importance of the Supreme Court of the USA, and it is fascinating. The Story Collider: This podcast takes scientists and gives them a platform to discuss their discoveries, their challenges, their triumphs, their inspirations, and more. It is science, it is a story. Serial: This podcast is a commitment. The first season goes into a court case, about a girl from a Baltimore High School who goes missing, the man who is accused, and the innocence that he claims. Every new episode goes to a deeper part of the story, a new witness, a new suspect, a new claim. And the end isn’t set, even still. Embedded: This podcast, as they say, takes a news story and goes deep. They travel around the world, to the Texas Gang Shooting, to Doctors Without Borders in Haiti, to a district school system in Pennsylvania, to the capital of El Salvador. It is fascinating to hear a news headline turned inside out, with an hour of interviews that are often poignant and unexpected. A highly recommended podcast. The Sporkful: Dan Pashman talks about the joy of food in his podcast “for eaters, not foodies.” It’s a celebration of food, eating, customs, and all the things in between. The series “Other People’s Food” and “Who is this Restaurant For?” were both stunning, enlightening, and enjoyable. I also found the Maria Bamford episode particularly entertaining. Gastropod: Two lovely ladies talk food, the historical and cultural context that makes what we eat common. Some personal favorites are The Buzz on Honey and The United States of Chinese Food. This light and joyous podcast is a good listen while in the kitchen! On the Media: If you are into news, I find On the Media very informative and clear. Although, the reason I recommend them is because of their recent series on poverty in America: a look at the myths that surround poverty and stories of how it works in reality.